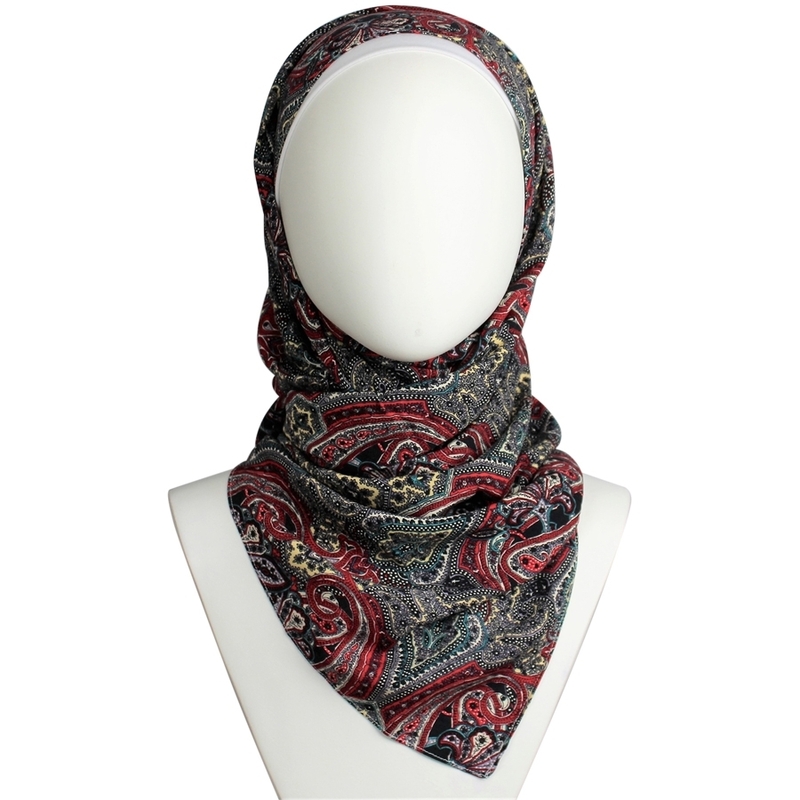 Looking for a hijab that can be worn regularly (yes, we mean for errands and work), yet looks as if it's a different scarf each time? Just imagine the many ways and outfits you can wear this scarf-collection with. This collection Combines a beautiful mix of colors for a burst of freshness, and with this hijab, you can play with multiple undercap colors, tops, and different styling wraps.. My friend, it's drapey, soft and cool! Drapey fabric that feels cool and soft to the touch, designed so you can wear them and match them with a variety of solid plain tops. Modern patterns, selective colors, and your comfort in mind.. this collection is a must have! Gentle Cold Cycle. Do not bleach. Wash with like colors. Air Dry or Tumble Dry at low heat. We recommend using Garment Steamers with all our products. We can’t wait till you receive and enjoy your item(s)!! In order to ensure that you receive your order in a timely manner, please make sure you provide the correct street address and phone number –shipments cannot be made to a post office. We are not responsible for orders not reaching the destination if correct addresses are not provided by the customer. We offer FREE SHIPPING via USPS Mail on all domestic orders, this takes between 2-5 days to deliver. If you want your order sooner, we also offer USPS Priority Express for $22.95. All the above shipping policies apply to domestic shipping within the USA. Shipping to Canada is at $15 only!! Shipping takes about 7-14 days to deliver. If you need Express International Shipping to Canada, please contact us at before you place your order as the shipping cost might change. International Shipping for all other countries varies based on region. Please contact us for details. **Lina Zibdeh Cover Couture is not responsible for customs, duties, tax fees attributed to international shipments. Our main goal is for you to be satisfied with your purchase; you can return the product(s) for up to 7 days from the date you receive your package. You will get a full refund back to the original method of payment once we receive the returned package. Any product you return must be in the same condition you received it; unworn, unwashed and undamaged. Please keep the receipt. Please contact us through our website so we can arrange the return of the item. As we gladly accept returns, the return shipping label will not be our responsiblity if the item has any signs of visible wear, in that case, you will be responsible for paying the return shipping label, and we reserve the right to void any return transaction if there are any visible signs of wear. * Please note that if the package was lost or damaged, we will not issue a refund for your order. Sale items and Clearance items are not eligible for exchange or refund. The processing time for exchange is about 10 business days following the reception of the product. International refunds or exchanges are not eligible. Please make sure of your selections before proceeding with your order. We carefully check each of our products before they get to you. If, for any reason, one of our products you receive is not the right one or has a defect, please contact us via our website and we will replace it free of charge or provide a full refund, as appropriate. In this case, we will also bear the shipping charges and pay you the cost of the return postage. If the returned product was found to be damaged due to the buyer’s misuse, the buyer will be liable to the cost of the product and shipping charges. Lina Zibdeh Cover Couture will only refund via the original method of payment. Once we receive the package and review it, we will send you a confirmation email and refund you the money as soon as possible. You can cancel your order as long as it has not been shipped. Please contact us via our website to cancel your order and to get information on the refund procedures. Copyright © 2019 Lina Zibdeh The Joy Of Hijab. All rights reserved.